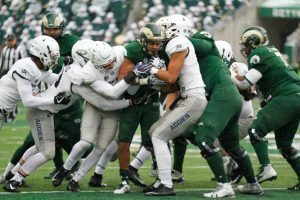 A frigid 28-degree kickoff temperature and consistent fall of snow greeted the 23rd ranked Utah State Aggies to Canvas Stadium on Friday, as the Colorado State Rams hosted them for a late-November contest. In addition to hosting a ranked team, CSU also had a few other special occasions for the game, take-a-kid to the game day, Civic and Service Day, Extra Yards for Teachers, Commitment for Campus, and Senior Day all happened to be in effect as well. About 19,226 was the official attendance, but I would be shocked if there were ever more than about 10,000 in their seats at the same time, as the snow, cold and poor season kept most fans from attending this late-season contest. The Rams had an early chance to take a lead, as they were left with a 42-yard field goal attempt with 4:42 to go in the first. Wyatt Bryan missed that field goal. Utah State followed that miss with a long drive to CSU’s 6-yard line. Dominik Eberle knocked down the 23-yard field goal to give the Aggies a 3-0 lead. Colorado State followed that with a long drive of their own, highlighted by a 36-yard acrobatic catch by Bisi Johnson. With a 2nd and 8 on Utah State’s 9-yard line, Aaron Wade intercepted Collin Hill’s pass and took it to the house, a 95-yard pick-six. One would assume that the 95-yard interception would deflate the Rams, but they came back and put together another great drive, this time capping it off with a touchdown. An 8-yard Izzy Matthews’ run gave the Rams their first score and made the game a three-point contest. At halftime, CSU led the yardage total 276 to 124 for the Aggies. At 10-7 Colorado State was surprisingly still in the game. The missed field goal and potential 14-point swing of the pick six hurt the Rams badly though, as the score could’ve been as good as 17-3 in CSU’s favor. Utah State started the second half off strong, with a 51-yard kick return to CSU’s 48-yard line. Colorado State buckled down and forced a 3-and-out, including a negative 8-yard rush on first down. Olabisi Johnson helped lead another long, incremental CSU drive; including another spectacular 22-yard reception. The 13 play, 61-yard, 6:21 minute drive stalled out on Utah State’s 5 yard-line, bringing up a 22-yard field goal for senior kicker Wyatt Bryan. This time he converted, tying the game up at 10-10 with 7:28 to go in the 3rd quarter. After Utah State moved the ball very efficiently on the next drive, CSU tightened up on defense, and forced a 26-yard Dominik Eberle field goal, bringing Utah State back to the forefront, 13-10. A huge moment for CSU, and the most clutch stand they had made in the game kept it close. On the next drive for the Rams, Collin Hill threw another interception. This one also was returned for a touchdown, this time by Jontrell Rocquemore. Utah State led 20-10, but with plenty of time left, 2:37 still to go in the 3rd quarter. Anthony Hawkins followed up the touchdown with a phenomenal return, to Utah State’s 37, but a hold brought the ball all the way back to CSU’s 10. An offsides and defensive holding helped Colorado State move the ball as they tried to keep in close. Colorado State was forced to punt. However, Ryan Stonehouse faked the punt, and threw an 11-yard first down pass to CB V.J. Banks to keep the drive alive. Utah State continued to be undisciplined, and a defensive pass interference on a deep pass kept CSU’s hopes alive. Later in the drive, a throw-away pass lobbed in the air was grabbed by Bisi Johnson (again in a phenomenal fashion) for a gain of five yards, preventing an intentional grounding call. Preston Williams finished off the seven-minute, 90-yard drive with a 9-yard touchdown reception. Wyatt Bryan converted the extra point, keeping the game close at 20-17 with just over ten minutes to go. Utah State again quickly drove the ball down the field, this time getting to CSU’s 20. A wideout-reverse failed, lost Utah State 4 yards and again forced a field goal. Utah State led 23-17 with seven minutes remaining. CSU’s defense continued to perform, with another “bend don’t break” stand, only allowing 9 offensive points to be scored of Utah State’s 23. An offensive pass interference and a 9-yard sack forced a CSU punt, and returner Deven Thompkins muffed it, allowing CSU to recover the ball. Restarting the drive from Utah State’s 20-yard line, Collin Hill struck quickly with another touchdown pass to Preston Williams. CSU tied it up, 23-23 and awaited an extra point to take the lead. Wyatt Bryan did not disappoint and knocked it down. CSU led 24-23 with 1:36 left in the game. Utah State drove down the field once again. From the Rams’ 33-yard line, Jordan Love scored USU’s first offensive TD, a 33-yard pass to Aaren Vaughns. The two-point conversion was good but called back due to an ineligible receiver downfield. USU again went for two, this time failing. CSU would get the ball back with 0:43 left to go, and all three timeouts, trailing 29-24. After an incompletion, a 9-yard scramble by Collin Hill was bolstered by a late hit, bringing the ball to midfield. As time expired, Collin Hill bombed it into the endzone. Preston Williams came down with it. A 34-yard touchdown. But an illegal touching call, brought it back, and by rule, lost the Rams’ down. CSU had gone from the top of the world to the bottom in a matter of seconds. On CSU’s side, Matthews had 20 carries for 100 yards, Bisi Johnson had 7 catches for 107 yards, and Preston Williams had 6 catches, 77 yards and two touchdowns.